The White Rose memorial exhibition 'DenkStätte Weiße Rose' | Weiße Rose Stiftung e.V. The ‘DenkStätte’ memorial to the White Rose in the heart of Munich’s Ludwig-Maximilians-University (LMU) is a central place to commemorate the history of the White Rose students’ resistance. 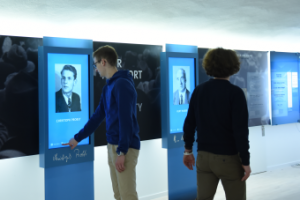 The new permanent exhibition offers a comprehensive overview of the history of the White Rose and places their resistance in the context of the National Socialist terror regime and the criminal war. The exhibition focuses on the group’s motives and motivation to resist, their resistance activities, the contents of their leaflets and the expansion of their resistance beyond Munich to Ulm, Saarbrücken, Hamburg, and other cities. A special chapter is dedicated to the history of remembrance of the White Rose between 1943 and today. Nine interactive media installations help understand aspects such as the biographies of the White Rose protagonists. Film clips show contemporary witnesses giving testimony of the expansion of the resistance as well as the ensuing prosecution, detention and trials. The exhibition’s bright and clear appearance with its interactive elements and texts in both English and German corresponds to the state of the art in research and museum education. Groups of 15 persons or more: please contact us to plan your visit, even if you are not looking to book a guided tour, in order to avoid collisions with other groups/guided tours – info [at] weisse-rose-stiftung.de. Groups that are not registered in our visitors calendar may be asked to wait in the inner courtyard while registered groups tour the memorial. The White Rose Foundation established the DenkStätte White Rose memorial in cooperation with the University. Then President of Germany, Roman Herzog, inaugurated the exhibit on 28 June 1997, the new exhibition was inaugurated on 18 February 2017. On 18 February 1943, Hans and Sophie Scholl distributed the sixth leaflet of the White Rose inside the university. They were arrested after tossing it from the second-floor gallery into the inner courtyard. Today, the very spot where the leaflet were likely thrown from is marked by a commemorative plaque created in 1946 by Theodor Georgii and honoring the seven executed members of the White Rose resistance group: Willi Graf, Professor Kurt Huber, Hans Leipelt, Christoph Probst, Alexander Schmorell, Hans and Sophie Scholl. A bronze relief sculpture in the LMU’s atrium is also dedicated to them. It was created by Lothar Dietz and unveiled in 1958. The inner courtyard itself had been heavily destroyed in World War II. After its restoration, the ‘White Rose organ‘ (Steinmeyer company, Oettingen) was installed there in 1961 in place of the original mosaic that had adorned it. A ground memorial from 1990 by artist Robert Schmidt-Matt shows White Rose leaflets, portraits and Willi Graf’s farewell letter in front of the University’s main entrance. 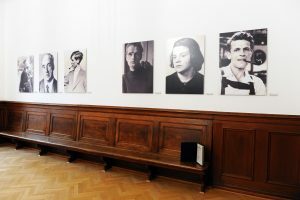 An exhibition entitled “Despotism – in the name of the German people” in the historic White Rose courtroom of the Munich Palace of Justice provides documentation on the first two trials against the White Rose resistance group. The exhibition was conceived as a cooperation between the Bavarian Ministry of Justice and the White Rose Foundation. It can be found in room nr. 253 (White Rose Room), where the second White Rose trial took place on 19 April 1943. It is accessible Monday through Thursday between 9 a.m. and 3 p.m. and on Fridays between 9 a.m. and 2 p.m. (except during exam periods: 10 April – 31 May and 10 October – 31 November). The exhibition shows portraits of the 17 defendants in both trials and copies of original documents from both trials. A commemorative plaque outside of number 13, Franz-Josef-Street, indicates that Hans and Sophie Scholl lived in a two-bedroom-apartment at this address from the summer of 1942 until their arrest in February 1943. Another plaque shows that Willi Graf and his sister Annelies lived at Mandlstraße 28 until they were arrested by the Gestapo. A granite cube commemorating the White Rose’s resistance against National Socialism is located at the northeastern corner of the Hofgarten right in front of the arcades. The graves of Sophie and Hans Scholl, Christoph Probst, and Alexander Schmorell can be visited on the Perlacher Forst Cemetery; the cemetery’s memorial grove commemorates Hans Leipelt. A memorial stone on the Munich Waldfriedhof Cemetery is dedicated to professor Kurt Huber. The Stadelheim prison, where enemies of the regime were executed, is open to visitors after prior appointment. Helga Pfoertner: Mit der Geschichte leben. Mahnmale, Gedenkstätten, Erinnerungsorte für die Opfer des Nationalsozialismus in München 1933-1945, 3 volumes.